Dry, flaky skin - Although horses can suffer from dry, flaky skin at any time of year, owners may notice it more during winter months. Dry skin may be caused by a variety of factors including nutritional deficiencies, parasites, or allergies. Consulting with your veterinarian can help determine the most likely cause of the problem and best course of therapy for your horse. Rain Scald – Technically refered to as dermatophilosis, rain scald is caused by the bacteria Dermatophilus congolensis. We typically think of rain scald as a summer problem in the United States. 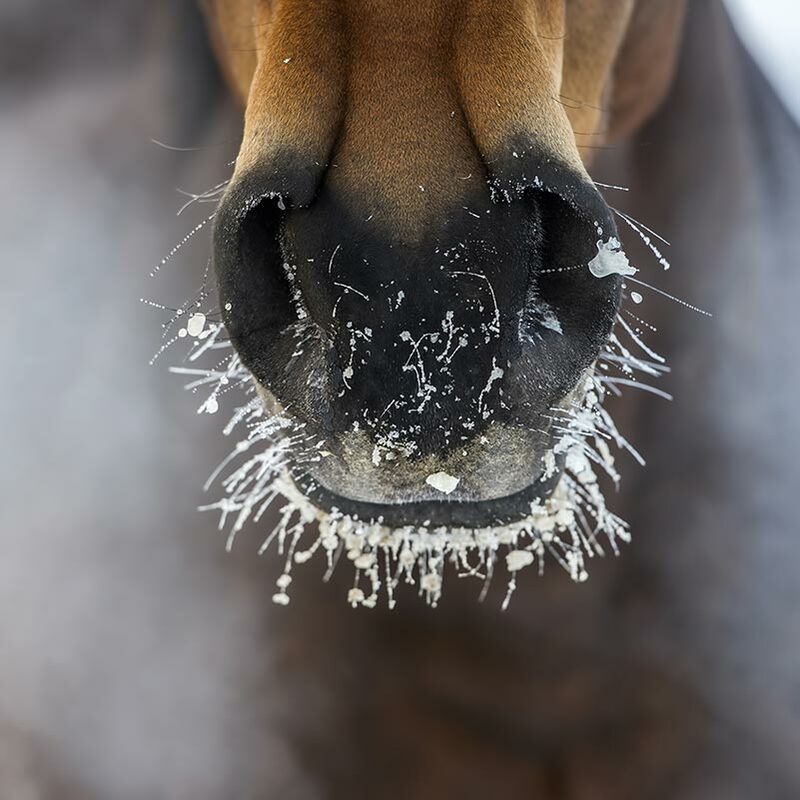 However, for horses that spend their winters on pasture, and in climates where winter is more associated with rain and mud than snow and ice, it can be a problem during the winter season. Keeping horses skin dry and out of moist conditions such as mud is the best prevention for rain scald. Use of a product containing lanolin on susceptible areas such as the ventral abdomen and the cranial aspect of the cannon bones may be helpful in persevering the skin’s barrier function. Scrubbing affected areas with saline or dilute chlorhexidine can also be helpful. Excessive grooming of affected horses should be avoided. When grooming is necessary, owners should use equipment exclusively dedicated for the affected horse as to prevent cross contamination. Severe cases of rain scald may require veterinary intervention. Scratches – Typically affecting the fetlock and pastern, scratches can be caused by a variety of pathogens. There is some thought that horses with white areas or feathers on their distal limbs may have increased susceptibility to scratches, although most of the evidence is anecdotal. Much like rain scald, wet, muddy, and dirty conditions can predispose horses to scratches, as those conditions may break down the skin’s natural defenses. Decreasing exposure to those environments can go a long way in minimizing or preventing scratches. Mildly affected horses may get resolution with scrubbing and topical treatment. More severe cases will require systemic treatment by a veterinarian. The good news with most of these skin problems is that they readily resolve with appropriate changes in management practices, and in some cases diet and supplementation. Wishing you much warmth and dry pastures this winter!